The Indianapolis Motor Speedway Museum thanks the current owner and looks to a future relationship with the winner of one of the most anticipated auto auctions of the year: the sale of the 100th Indianapolis 500-Mile Race-winning Dallara IndyCar. Mecum Auctions is scheduled to sell the No. 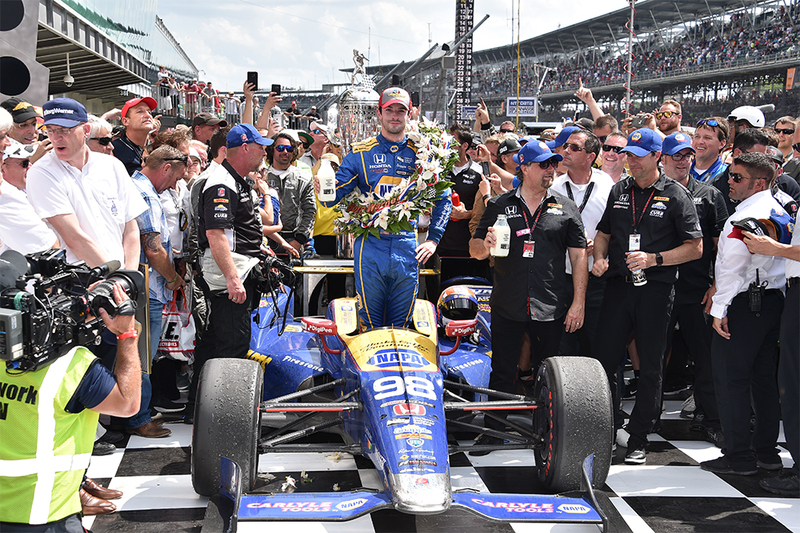 98 NAPA-sponsored Indy car driven by Alexander Rossi to one the most dramatic wins in motorsports history, at IMS in 2016. The auction is set for Saturday, Aug. 25 in Monterey, California. Rossi, a rookie at the 100th Indianapolis 500, won by skillfully completing the final 36 laps without a pit stop – far beyond the normal pit window. IMS Museum Curator of Vehicles Jason Vansickle said the working relationship with the current owner of the No. 98, Bowen Motorsports, has been extremely beneficial to all parties. The Museum is hopeful the new owner will consider a donation or long-term loan of the car to the Museum. Bowen Motorsports has stipulated in the bill of sale that the new owner will be required to loan the car to the IMS Museum for display every April, May and June, annually. “It’s a common misconception that the IMS Museum, or the Speedway, automatically receives the winning cars from the Indy 500,” Vansickle said. “The Museum owns 33 winning cars, spanning a total of 37 race wins, but we have to rely on the generosity of private collectors to donate or sell them to us at below-market cost. Bowen also allowed the IMS Museum to loan the No. 98 to the Heritage Museum in Cape Cod, Massachusetts, where it is on display as part of an Indy 500-themed exhibit. The IMS Museum is a 501(c)3 not-for-profit entity, separate from the for-profit Indianapolis Motor Speedway. The Museum does not have funding available to bid into high-end auctions. Vansickle said the Museum will eagerly await the results of the Mecum event at Monterey, in hope that the new owner of the 100th Running winner will negotiate a donation agreement or long-term loan arrangement that benefits both parties. “The Indianapolis 500 is seeing great interest as it settles into its second century, and the IMS Museum is planning for new exhibits and expansion,” he said.